Notification give users a report on their activities and their dates. They are located at the top right, next to the user’s portrait. The green color displays the number of unread emails to the user, where we click on the icon to preview the last five emails . The notifications give an overview of the number of cases handled by the user. These refer to those cases whose status is ongoing and are not in past the due date. 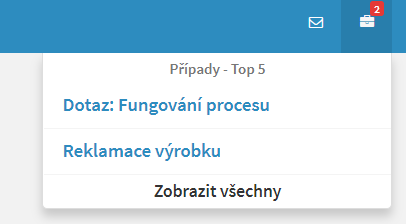 This notification gives an overview of the number of tasks that the user is responsible for. In addition, you can see the 5 tasks that are closest to the due date of your task. For each of the 5 selected tasks, the percentage complete is displayed.